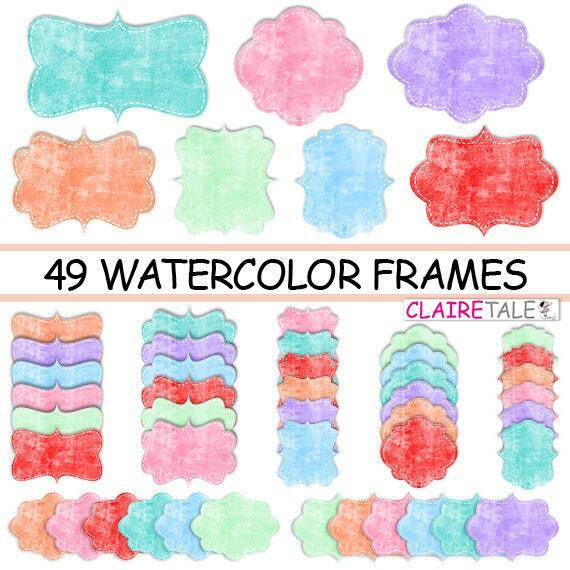 49 watercolor clipart tags: "WATERCOLOR FRAMES" colourful clipart frames, labels, tags - pink, red, blue, mint, coral, aqua blue, purple tags for scrapbooking, cards, invitation, stationary, albums, web banners, journals and other paper or digital products. 49 PNG files with 49 separate frames on a transparent background, all in high definition. Size: approximately 5 inches (12,7 cm) at 300 dpi, 1500 px width or height, but can easily be resized. This was a beautiful download and easy to use.